When you install Office 365 and then start it, it might occure that the error messages 0x80070005 is shown and you are unable to activate it. 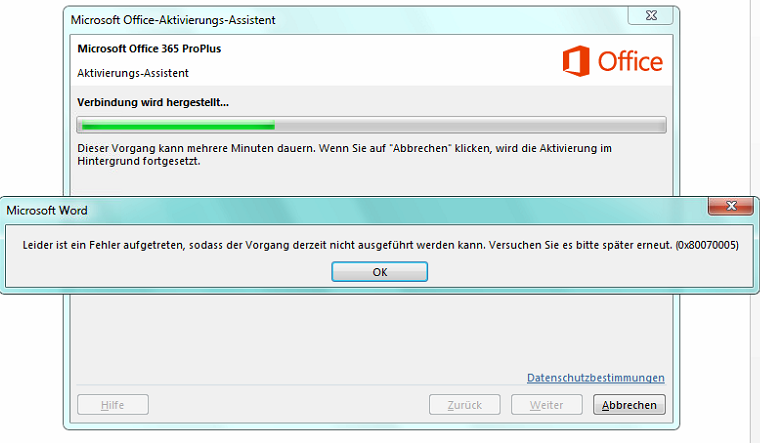 Usually you don't have to activate Office 365, since it is already "bound" to your online account. So Office is automatically activated. When you see this dialog, then there is a problem with rights on your system. The simplest way to solve the problem is to run Word or Excel once as administrator. Just right click on word and then select "Run as administrator" and you won't even see the activation stuff. It will be activated in the background and after closing word you just can use the office 365 suite as usual.